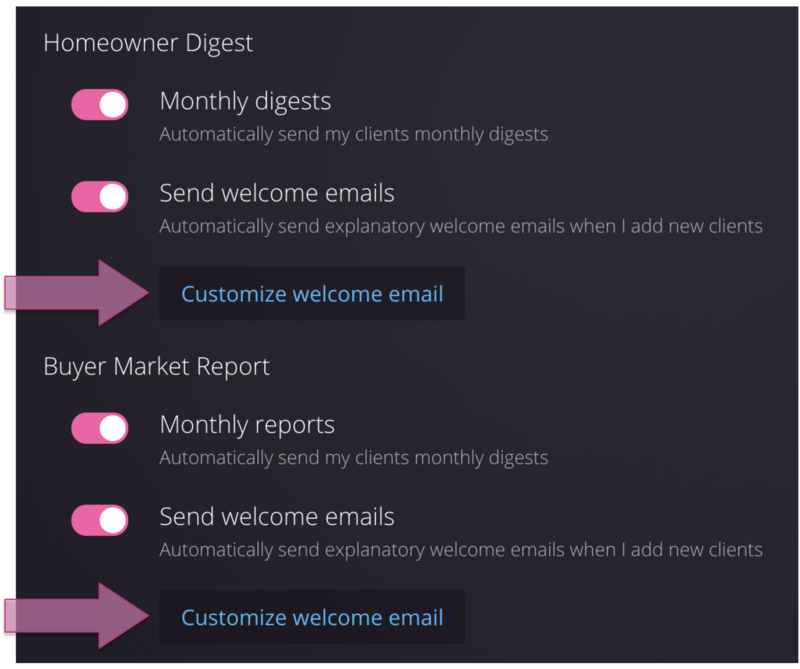 We always recommend sending an introduction email to your new clients and leads before sending them their first Homebot Digest. Sending an introduction email is a great way to boost open-rates by 10% or more. It lets your clients know about Homebot before it arrives and to keep an eye out for it. It's also a great way to have a touchpoint with your clients that creates anticipation for something we know they're going to love. This new feature is optional and can be turned "on" or "off" in your Profile Settings (click your name / picture in the upper-right corner to open your Profile settings). Now, click DIGEST SETTINGS. Can I customize the welcome email? Yes! Click Customize welcome email to edit the template email. Click Save Changes once finished. When turned On, Homebot will take care of the rest. We will also send a welcome email to any new leads who join via your lead capture page (but this version is a little different since these users are already expecting a Homebot digest). Can I still send my own Welcome Emails? Yes! If you want to send your own welcome email through your own system, just be sure this setting is turned Off in your profile if you don't want Homebot's version to send. If I turn it on, will my existing clients receive it? No. If you turn it on, only buyers you add moving forward will receive a welcome email. I am excited to let you know that I have invested in a new technology called Homebot that you will soon be enjoying (free of charge)! You will be receiving a free monthly email called the “Homebot Digest”. Homebot offers homeowners a highly personalized report containing valuable information to empower you to make smarter financial decisions when it comes to your home. If you think the value of your home is incorrect, you can challenge the value to improve the future accuracy. I hope you find this information valuable; however, if you are not interested in receiving this report, please let me know and I will cancel your subscription, or simply click “Unsubscribe” in the Homebot email. You should receive your first report in the coming week. Please feel free to call or email me at any time and I hope you enjoy Homebot! By the way, with respect to the monthly automated value for your home, they can sometimes be off the mark. No worries! Just challenge the value (click the "Not my value" button) and Homebot will ask me to do a valuation analysis for your home, which I'll be happy to do.